Let’s talk about the best self-warming dog mats! Does your dog get chilled? This is a common issue among many pets, especially those with short coats, like a Greyhound. But help is here (without having to turn the thermostat up to 90 or using electrical cords). Self-warming dog mats are perfect for keeping Fido toasty in any location. Check out our picks for the best and some useful information to help you decide which one will work for you and your furry pal. Plus, we’ll also link you up for a tutorial on how to make your own self-warming pet mat. We’re loaded with info, so let’s get started! What is a Self-Warming Dog Mat? Any surface will get warm when it comes in contact with your animal’s body. The difference with a self-warming mat is the special layer of insulation within the mat or bed that radiates the warmth from your pet’s body, which helps keep them comfy. Having a warm mat or bed for your dog is important as it helps increase your pet’s circulation, which in turn, can promote healing in deteriorating muscles and joints. The self-warming mat is a marvel in its simplicity. They don’t require any electricity (so no cords for the puppy to chew), yet they really do work. 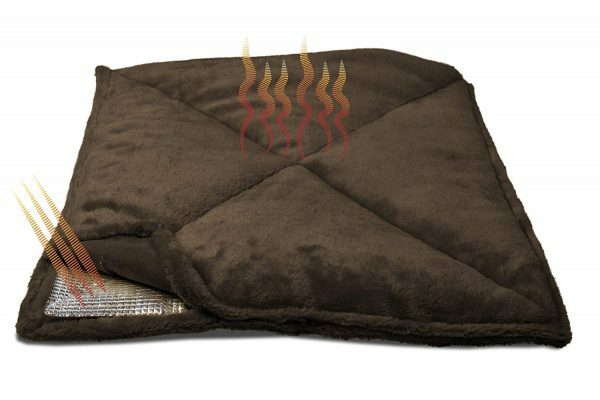 The self-warming mat will never get too warm because, again, it’s only being heated by your pet’s body temperature. Plus, you can pick them up and move them anywhere your pooch desires (they may even move the mat themselves). Are you convinced that a self-heated dog pad is right for your fur baby? Then we’ve found the best self-warming dog mats on the market right now. Check them out! Easy care, comfy, and will fit into any decor, that’s just a few of the qualities of the Easyology Premium Self-Warming Dog Mat . The key to the “warmth” of this dog mat is the reflective insert, which is also removable so you can launder the outer shell. 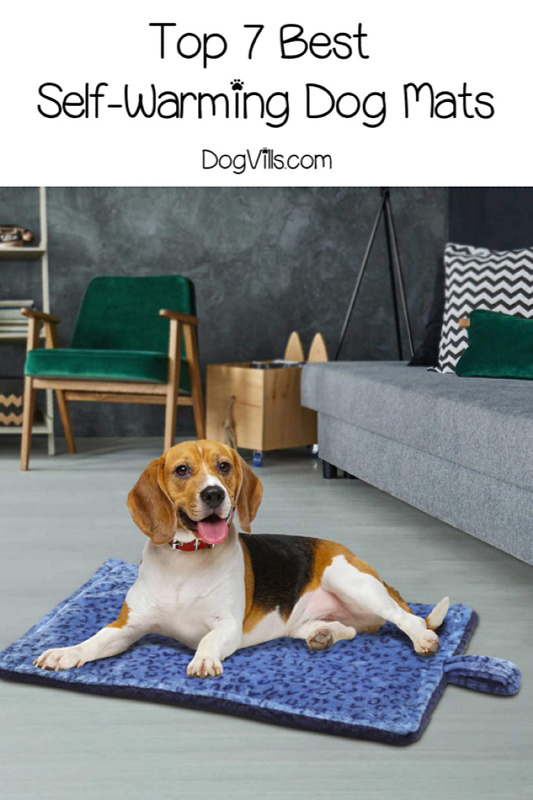 This self-warming dog mat comes in two sizes large (31.5″ x 17.3″) and jumbo (39″ x 21″) and five different colors and patterns. Plus, it’s made with non-toxic materials (just in case you have a chewer) and it has a money back guarantee! 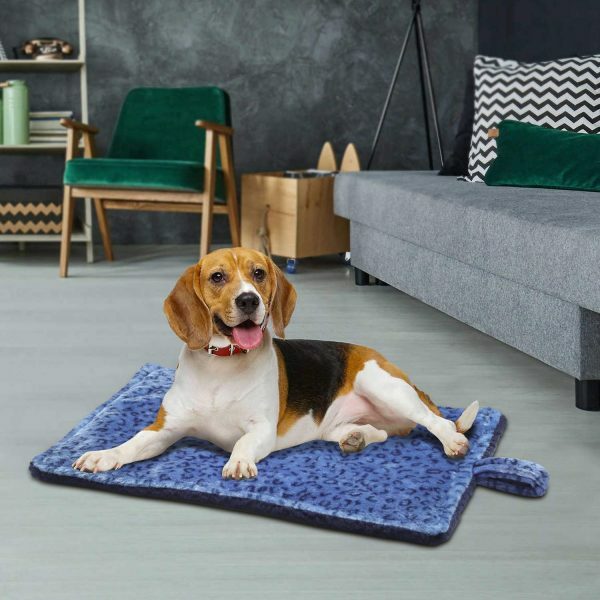 Made from ultra-soft materials, the Marunda Thermal Pet Mat is sure to be your dog’s favorite resting spot. The innovative inner layer will self-warm your pooch, so he stays comfy and cozy all night (and day) long. This mat measures 22″ x 15″ – perfect for small to medium-sized canines. The Marunda Thermal Mat even has a large loop on one end, which makes it perfect for pulling out of crates or carrying kennels. This two-toned reversible self-warming pet mat made by the K&H company is as comfy as it is beautiful. The unique materials in this mat absorb your pet’s body heat, ensuring your pup will stay nice and warm. It’s simple to use and durable to boot. This pet mat measures 21″ x 17″ and is machine washable. The K&H self-warming dog mat comes in two neutral colors (black/grey and oatmeal/chocolate), so they will match any decor. Available in six colors and patterns, the Furhaven Pet Heating Pad is a soft self-warming mat that is sure to become your pet’s favorite. It measures 17″ x 22″ so it’s large enough to suit both small and medium-sized animals. This self-warming mat does not use electricity. It works by capturing your pet’s body heat with an insulating polyester fiber batting core. This design is lightweight and portable enough to bring anywhere, including the car. This soft and soothing pet mat warms your dog to a comfy temperature while providing her with a cozy sleeping surface. This self-warming mat measures in at a generous 15″ x 24″ so it can be used for multiple pets or medium-sized dogs. The fuzzy outer shell is luxurious to the touch and will keep your dog happy for hours. The mat is low maintenance and can be thrown into the washing machine when it becomes stinky or soiled. Fido deserves to be comfy even when he’s taking time out in his kennel. That’s why the Aspen Pet Self-Warming Mat is a must-have. Because they are designed for kennel space, the Aspen Pet mat is available in seven different sizes. 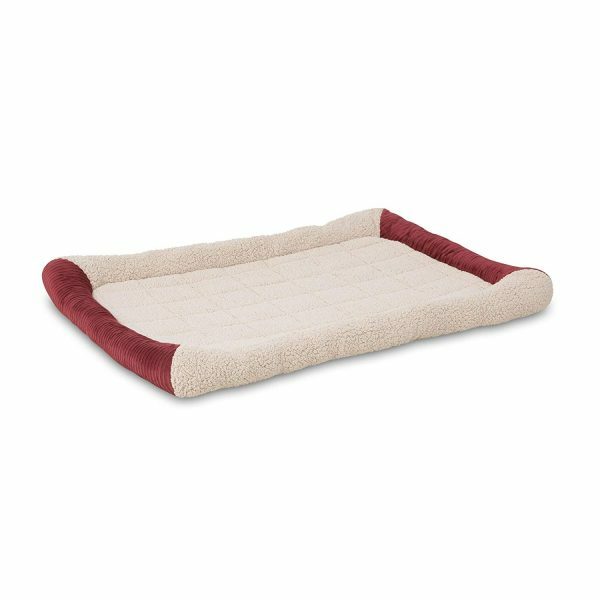 The slightly raised sides provide added comfort your pet will appreciate. The non-skid bottom will keep this mat securely in place. The sleep surface of the mat incorporates a layer of self-warming material that reflects the pet’s own body heat. Warm and cozy fabrics include faux lambswool plush with contrasting wide wale corduroy for a decorative touch. More than a mat, the Vangardio Thermal pet cushion provides the ultimate sleeping experience for your dog. Made from aerospace industry grade materials this pet mat reflects and preserves the body heat of your pooch. 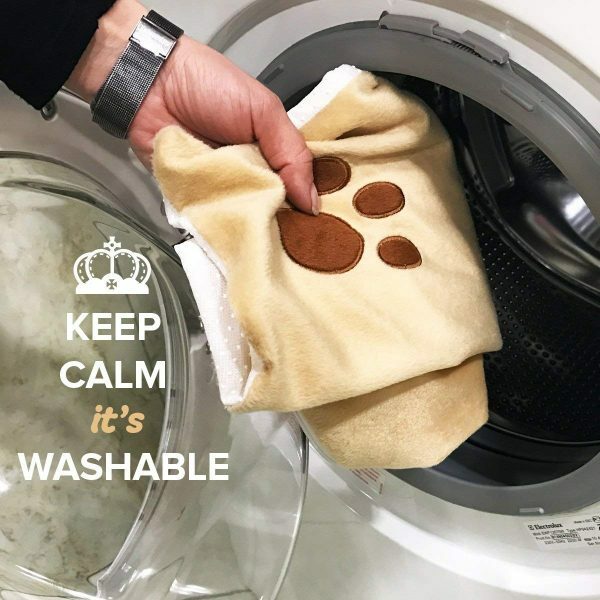 The outer layer is made from a velvet soft fleece material, and it has a non-slip material (with grippy dots) on the bottom to keep it in place. The ingenious design allows for easy removal of the cover by a simple zipper, so it’s washable by hand or washing machine. Are you “crafty?” Then check out this YouTube Video on how to make your own self-warming pet mat. 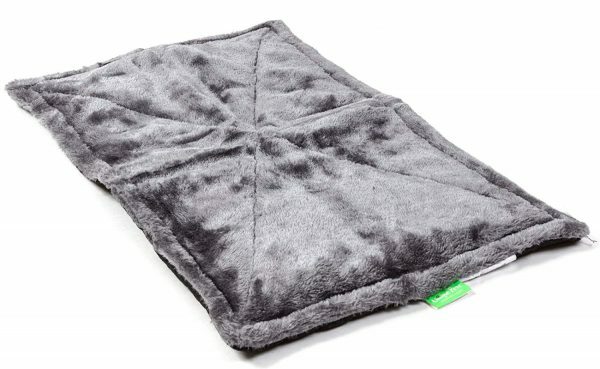 This pet mat is made by using emergency “survival” blankets and old towels. Great for both dogs and cats and can be made to fit any kennel. The self-warming dog mat is a useful, safe, and inexpensive way to help keep the chill off your furry friends. Use them at home, for traveling, or even after your pet is recovering from surgery or an illness. Every dog should have at least one of these self-warming pet mats. Have you used any of these best self-warming dog mats for your pup? Tell us about your experience with these useful beds.